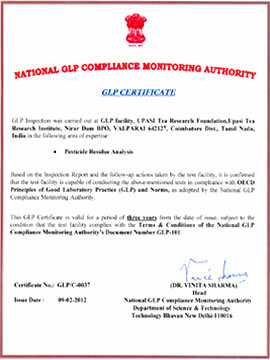 Chemical laboratories of the UPASI TRF at Coonoor and Valparai have been accorded accreditation by the National Accreditation Board for Testing and Calibration Laboratories (NABL) for their compliance with all clauses of general requirements for the competence of testing laboratories as per ISO/IEC: 17025:2005 which is followed internationally. 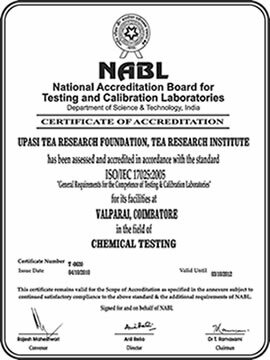 The scope covered under NABL accreditation of Tea Research Institute, Valparai includes analysis of PFA Act parameters for black tea such as total ash, water soluble ash, water insoluble ash, alkalinity of water soluble ash, acid insoluble ash, moisture, water extract and crude fibre besides caffeine and certain pesticide residues. In addition to the above, analysis of fertilisers, agricultural grade fine chemicals, micro nutrient mixture and certain pesticides are also included under the scope of accreditation at Tea Research Institute. 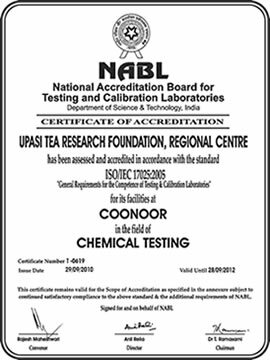 The UPASI TRF lab at Coonoor obtained NABL accreditation for the analysis of PFA parameters for black tea besides fertilizers, micronutrients and certain fungicides. UPASI Tea Research Foundation was granted GLP certification for its Pesticide Residue facility by the National GLP Compliance Monitoring Authority, Department of Science and Technology in compliance with OECD Principles of Good Laboratory Practice (GLP) and Norms.